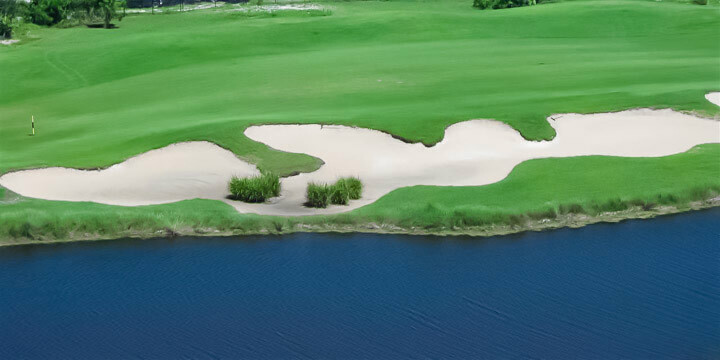 The Lost Key Golf and Beach Club is a 413-acre master-planned community in Perdido Key Florida, featuring a golf course, country club, marina, and homes of all types and prices. The entire community is gated and private with homes and condos both on and off the "Old River" channel. The amenities that all the residents share are amazing. 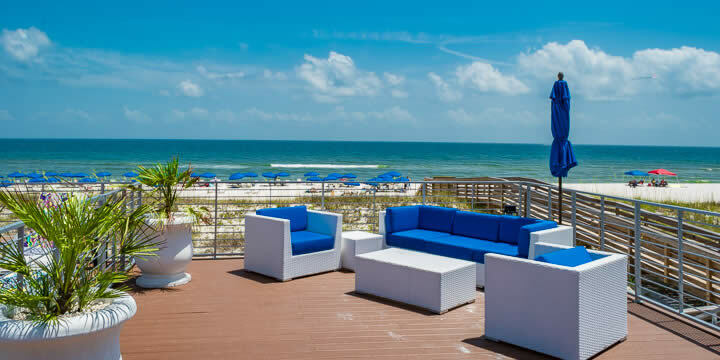 The Beach Club is a 5,000 sq ft clubhouse and country club facility on the Gulf that features a beachfront pool with bathhouse, fitness center, several dining options, full-service bar, and private lockers. The Beach Club is only accessible to residents and guests, offering a shuttle service for residents of Lost Key. The marina is located along the Big Lagoon, about six miles east of the golf course in Pensacola. It offers almost 200 wet and dry boat slips that can accommodate boats up to sixty feet. An intricate pier design provides on-site amenities such as boat lifts, vessel loading, fueling, and anything a boater might require. The 18-hole Arnold Palmer designed golf course provides a clubhouse with restaurants, pro shop, locker room, and practice facilities. Attentive staff members provide event planning, group play, and professional instruction if desired. The pro shop offers the latest in equipment and apparel. Lighted tennis courts and a pool are nearby as well. Optional Membership includes free green fees with cart rental and use of the driving range. The golf course is an Audubon sanctioned nature preserve. The original real estate in Lost Key included four condominium towers, simply called by the same name - the Lost Key Golf and Beach Club condos. They are located in different parts of the master community. The San Anton tower is near the water, and the others are grouped together around the curve. The building names are: San Anton, San Andres, La Salbadora, and Santa Amaro. Lennar Home Builders has developed townhomes to the southwest of the peninsula near the water, sometimes referred to as 14500 Salt Meadow as they are all on that street. These are elegant two-story Lost Key townhomes available in two or three bedrooms and are priced around $400,000. They offer views of several small ponds and a nature preserve. For those looking for something larger than a condo or townhome, there are four-bedroom villas bordering the golf course and nature preserve. The Lost Key Villas are sized up to 2,100 square feet, with a two-car garage and large neighborhood pool. Built in 2007, the single-family two-story Lost Key Plantation Golf Homes are directly on the golf course. Offering 2900 sq ft, these colorful Charleston-style beach homes have every luxury and gorgeous views of the greens. 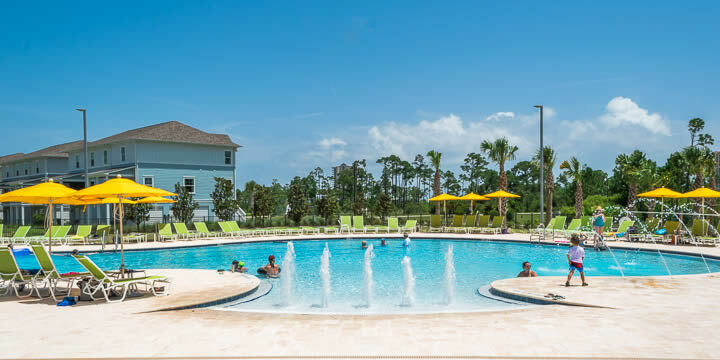 Lennar is presently building some small but beautifully landscaped single-family homes on Perdido Key Drive, directly across the street from the Gulf. These are three bedroom homes from 1,550 to 2,072 square foot with yards that look like a flower garden and a simple walk to the beach. They are the most far away from the golf course, but close to the new beach club, and include the use of these amenities. You can walk to the Beach Club and catch a shuttle to the golf course or tennis courts. These are currently in the pre-construction process. Lost Key is constantly growing, and there will surely be more homes and villas as time goes on. Call us for a complete list of everything that is available and we will take you on a tour to see everything this fantastic community offers.